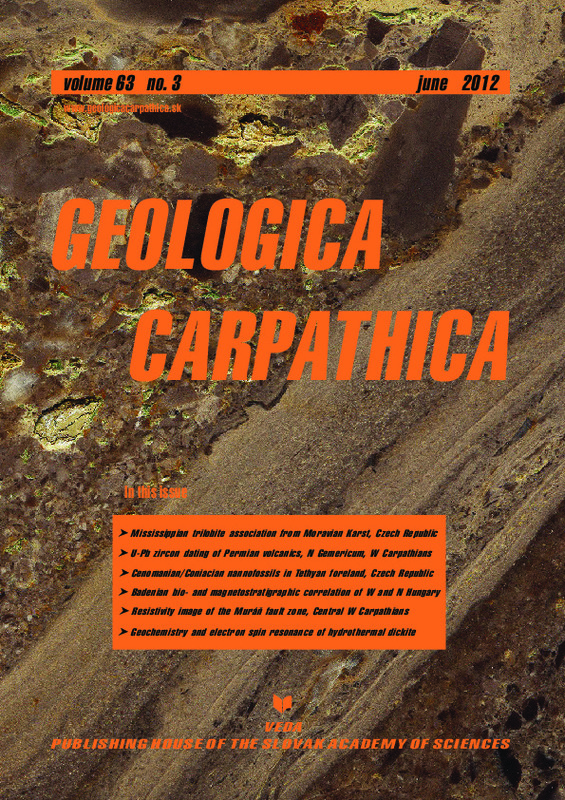 Abstract: Nannofossil biostratigraphy and mutual correlation was worked out for the Cenomanian-Coniacian deposits of the Bohemian Cretaceous Basin (BCB) and Outer Western Carpathians (OWC) in the territory of the Czech Republic. Similar assemblages of the BCB and from sediments deposited on the SE slopes of West European Platform, Waschberg-Zdanice-Subsilesian Unit, OWC support the hypothesis that the two areas were connected by a sea way (nowadays the Blansko trough). The nannoflora of the Silesian Unit, OWC show more afinity to high latitudes as is documented by the presence of Marthasterites furcatus in the Lower Turonian, UC6b and UC7 Zones. Turonian and Coniacian deep-water flysch sediments of the Silesian Unit and Magura Group of Nappes provide nannofossils on rare occassions. Strongly atched nannofossils dominated by W. barnesiae from Cenomanian black shales of the BCB are comparable to those of the Silesian Unit and reflect a similar shallow nearshore sea. In the BCB, uppermost Cenomanian is marked by the last occurrence (LO) of Axopodorhabdus albianus and first occurrence (FO) of Quadrum intermedium (6 and 7 elements) and lowermost Turonian by a sudden quantitative rise in nannoflora and by the FO Eprolithus octopetalus. First Eiffellithus eximius and thus the base of the UC8 Zone was recorded in the upper part of ammonite Zone Collignoniceras woollgari in the lower Middle Turonian. Lithastrinus grillii is the stratigraphically youngest nannofossil species in this region and indicates the uppermost Coniacian. In the OWC, the Albian-Cenomanian boundary was recorded in the Silesian Unit and is marked by the LO Crucicribrum anglicum and FO Prediscosphaera cretacea and Corollithion kennedyi in the uppermost Albian. The Turonian-Coniacian boundary found both in the BCB and Waschberg-Zdanice-Subsilesian Unit, OWC is indicated by the FO Broinsonia parca expansa and by the base of the interval with common Marthasterites furcatus. In both areas, events were found closely below the FO inoceramid species Cremnoceramus waltersdorfensis. The Coniacian-Santonian boundary interval (Waschberg-Zdanice-Subsilesian and Foremagura Units, OWC) is indicated by Lithastrinus grillii occasionally accompanied by Lucianorhabdus ex gr. cayeuxii, Hexalithus sp. and Arkhangelskiella specillata.